Almost every bowed string instrument player has run into a problem with their strings going out of tune. Most of the time, this problem (on a violin, viola, or cello) is caused by a slipping peg. In fact, when a customer walks into our store with a broken string, 9 times out of 10 the cause of the break was over-tuning of the string. This is an even more common occurrence when the peg has slipped dramatically out of place and the player (or family member, neighbor, or helpful friend) has attempted to retune an almost completely slack string. 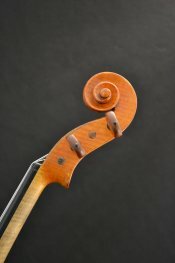 What many beginning players do not realize about the violin, viola, and cello design is that traditional, wood pegs are held in by compression. In addition to offering a lighter weight option than a set of gearheads, the compression fittings of wood pegs make fine tuning the instrument a more precise art. The pegbox contains 4 sets of holes—1 set for each peg. Each set of peg holes is tapered to match the shape of each peg; the side of the peg closest the peg head is thicker than the opposite, thinner end of the peg. The string is attached by threading the string end into the hole in the peg, winding the string into place by turning the peg away from the player, and pushing the peg gently into place when the string has reached its full tension. Because there is so much relying on the peg remaining still once it is gently pushed into place, there is a lot riding on how well each peg fits and makes contact with the peg box. 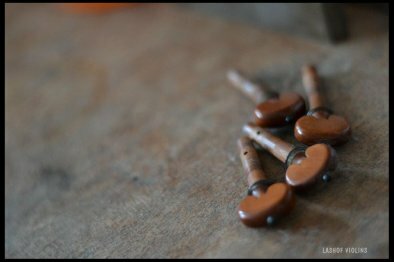 One of the reasons we use the different woods selected for the pegs (Ebony, Rosewood, and Boxwood) is their ability to compress over time; compressing pegs put less stress on the original wood of the pegbox and can be replaced over time as they wear out. We have compiled a list below of the most common causes for slipping pegs. This may be the most obvious cause of a slipped peg(s)—accidentally bumping your scroll on your music stand or having someone trip and kick your case can cause the pegs to lose their hold in the peg box and unwind. The solution to this problem is to avoid collisions when you can by storing the instrument and case out of the way of foot traffic and, in the event an accident does happen, bring it in for a free check-over to make sure nothing major happened in the jostle. This is the single largest culprit of slipping pegs in dry climates and in dry fall and winter months. As we frequently preach, humidity is one of the most important things to maintain for your instrument and bow. Imagine your home during humid summer months, you may find it is more difficult to close a closet or bedroom door, but in the winter this is not a problem. Pegs go through very similar changes—high humidity can cause them swell and stick in place and low humidity can cause them to shrink and lose their grip in the pegbox. The solution: Humidify your case (or store your instrument in a room with 40-60% humidity) and apply either LAVA brand bar soap—our preferred method—or a commercially available peg compound to your pegs. Making sure to only adjust one peg at a time, remove the string from the peg, remove the peg from the pegbox, and apply a thin line of LAVA soap around the peg where it makes contact with the pegbox. Return the peg to the pegbox, turn the peg a few times to work the soap in, and re-install the string. And a little PSA—please do not use peg drops or chalk on slipping pegs. We have seen countless numbers of instruments with pegs frozen in place and pegs broken or scrolls cracked because of chalk and peg drops. Their benefits do not outweigh their potential for damage! Normal tuning can cause pegs to compress and go out-of-round. A peg which has gone out of round will be resistant to tuning, even after application of LAVA soap/peg compound. The solution: If you suspect your peg(s) is out of round, bring the instrument in for inspection and peg adjustment or replacement. As we mentioned before, normal tuning can cause pegs to compress. As they compress and press further inward, the string hole moves closer and closer to the scroll. Eventually the string hole will get too close to the peg hole and the peg will no longer be able to easily fit into the peg box. The solution: Provided the peg is still otherwise functional, bring the instrument in to have a new string hole drilled into the peg. It is often a quick solution and can happen while you wait. Sometimes, when a string is installed into a peg, the string is wound too close to the pegbox wall. This can cause the string to become trapped or cause it to act as a wedge between the peg and the pegbox which ultimately pushes the peg back out of the hole. The solution: Rewind the string onto the peg, taking special care to leave space between the pegbox wall and the edge of the string winding. This problem is more likely to happen on the strings further up in the pegbox (for violin E, A, or D and for viola/cello A, D, G). This problem is caused by pegs which have become (or have always been) out of alignment and are placed too high or too low in the pegbox. A peg located too high can reduce the clearance for strings whose pegs are further up in the pegbox. The solution: Bring the instrument in to see if we can make a small adjustment to your existing pegs or discuss bushing and repositioning your pegs to correct the problem. If you are still running into problems or are having a hard time diagnosing your current problem, don't hesitate to stop by for a free evaluation!